(CBS) - The documents that led to the release of two convicted murderers who are still on the loose bore the forged signature of a Florida judge, and an Orange County Clerk of Courts spokesperson says authorities may never be able to determine where the paperwork originated. 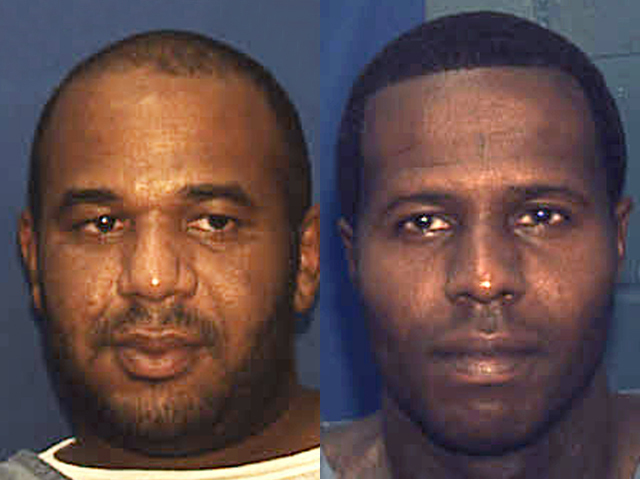 A manhunt is on for Charles Walker and Joseph Jenkins, both 34, who walked out of prison on Oct. 8 and Sept. 27, respectively, after paperwork bearing the forged signature of Ninth Circuit Chief Judge Belvin Perry was sent to the Department of Corrections. As CBS News correspondent John Miller reported Thursday, Perry's signature may be the easiest to find in Florida. As the presiding judge in the Casey Anthony murder case, his signature appears on dozens of court orders posted on the web. But Perry suspects there may be more at play here. "It doesn't take a Rhodes scholar," he said, "to realize that they had some outside help and hopefully the authorities will determine who that outside help was." "I don't know if we'll ever be able to determine where these pieces of paper came from," says Leesa Bainbridge, spokesperson for the Orange County Clerk of Court, the office through which the paperwork was routed. "We have thousands of pieces of paper coming through this office," Bainbridge told CBS News' Crimesider. "There's no way to backtrack and say whether this was mailed in, faxed, or left in a dropbox." Misty Cash, a spokesperson for the Florida Department of Corrections, said her department "didn't do anything wrong." "We initiated our typical procedure for an inmate release," said Cash. "The department followed our procedures and protocols to the letter." Miller reported that the way authorities discovered the wrongful release was, in fact, through following those procedures: they notified the victims' families that they had given them early release, and the victims' families called the prosecutors and asked, "How did this happen?" Walker was sentenced to life in prison in 1999 on a charge of second-degree murder. Jenkins was also supposed to be serving a life sentence on a 1998 first-degree murder, according to the Orlando Sentinel. The documents that led to Walker and Jenkins' release are remarkably similar. Each is titled "Order Granting Motion to Correct Illegal Sentence," and is followed by several pages of legitimate-looking and sounding legal language which explains that each man was improperly sentenced and due to be released. A spokesperson for the Florida Department of Law Enforcement told Crimesider that they were currently focused on apprehending Walker and Jenkins, but that there would be an investigation into the origins of the forged documents.